As an historic neighborhood, Old Braeswood’s Architectural Reviews will take into account a project’s characteristics including authenticity of style (ie. established historical or contemporary architectural examples), quality of design and materials; a design supportive of the original intent for a suburban garden community with discrete garage and fencing locations; harmony with the neighborhood (contextual compatibility and sensitivity to integrate with the surrounding homes) as well as trees and shrubbery that retain an open, garden like appearance from the street. Old Braeswood was developed in 3 sections beginning in 1928 with Braeswood Addition Section 1, which lies along Main Street and east of Kelving. Construction in Braeswood Addition (Section 2) and Braeswood Extension (Section 3) continued into the 1960’s and included mid century modern style homes. 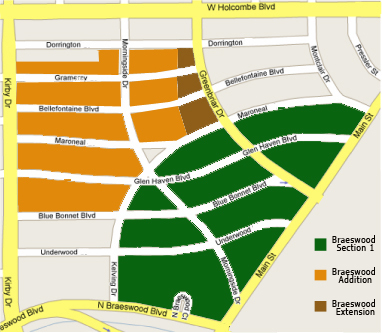 Old Braeswood Property Owners Association (OBPOA) is responsible for enforcing three distinct sets of Deed Restrictions, which vary slightly from section to section. Fortunately, most of the restrictions are common to the entire area. The following is a brief summary of the Restrictions used by OBPOA. Property can be used only for private residential purposes and can be occupied by a single family only. No businesses or store can be operated on the premises. Garage sales, daycare or private instruction of children FOR PROFIT are prohibited. No garage apartment or out-building can be occupied as a primary residence. Full-time paid domestic employees may occupy garage apartments provided status can be documented, i.e., IRS Form W-2, FICA Tax Receipts, etc. Garage apartments cannot be rented to part-time employees or provided in exchange for wages for domestic services. Owner’s family may occupy garage apartments during home construction or remodeling for a maximum of six months. No signs are permitted on property except those advertising sale or rental of the property. Such sign dimensions must not exceed 5 feet square. Contractor signs, political signs, etc. are prohibited. No livestock or poultry may be maintained on the property. City of Houston ordinances allow a maximum of 4 dogs on the premises, and require all dogs to be leashed when off premises. No construction, including fences, window replacement, driveway gates, addition of solar panels and structural remodeling, may commence until plans are submitted and approved in writing by the POA’s Architectural Review Committee. In addition, plans must be submitted for any exterior alteration including patios, all structural elements, and any exterior alteration requiring a building permit. Plan submittals, which will be retained by the POA, should include survey, proposed site plan, floor plan(s) and exterior elevations. Descriptions of construction materials and color selections may be required. Principal exterior material shall be stucco, masonry, or similar material and is required to be in character with surrounding structures. In Section 1, outbuildings must be of the same building material as the residence. No fence, wall or hedge may be placed in front of residence closer to the street than the front building line as indicated on individual plot description. This includes garden walls. As specified for designated lots. Set-back requirements for structures vary from Section to Section and are more complicated for Section 1. No building or part thereof shall be erected nearer to the front and/or side (for corner lots) street than the front and/or side building limit lines as shown on the property plot. There originally was an exception in Section 1, which now has been superseded by City of Houston Building Codes. 6 feet for lots less than 90 foot frontage. 10 feet for lots with front footage of 90 feet or greater. No residence, Including second story overhangs, attached porches, garages, or greenhouses, can occupy more than 80% of width of property measured at front building line. Chimneys or purely ornamental projections may extend 4 feet closer to side property line. 5 feet including attached carports, porches, and garages, but not detached garages at rear of lot. Attaching an existing garage to the main body of the house subjects it to the same set-back restrictions as the residence itself. Not specified Cannot encroach upon Utility Easements. Maximum of 20 feet wide. Maximum width of 50% of total property width measured at rear building line. Maximum width of 60% of total property width measured at rear building-line. Deed restrictions for Section 1 specifically state that no privy can be maintained on the property. While this interpretation can be extended to Port-O-Cans maintained on the property during construction, we merely request that they be discretely placed out of view of the surrounding neighbors. This request extends to all Sections of Old Braeswood. The Old Braeswood POA has achieved a very successful history of enforcement of deed restrictions. Suspected violations of deed restrictions should be documented and submitted in writing to the Executive Committee. The Executive Committee will initiate an appropriate investigation and pursue legal action if warranted. Anonymous complaints will not be accepted. Nearly two-thirds of the funds of the Old Braeswood POA are reserved for enforcement of deed restrictions.